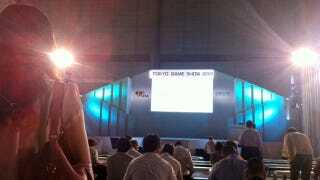 LIVE from the Tokyo Game Show 2011 Keynote, Starring Square Enix's Yoichi Wada! The main in charge of Final Fantasy, Dragon Quest and the many, many remakes of previous games in those series, Yoichi Wada, big bossman at Square Enix, is officially kicking off Tokyo Game Show 2011. What pearls of wisdom with Wada drop during his TGS keynote? Let's find out! The topic of Wada's talk is "The Undercurrent of Revolution in the Games Industry," which is certainly going to be... interesting? Let's hope so. Maybe he'll talk about that Final Fantasy XIII-2 branded PlayStation 3 that Square Enix and Sony just announced. Or perhaps he'll ramble on about video game history for an hour and read the patch notes for a Final Fantasy XIV update out loud. Who can say? Only Yoichi Wada. Follow along in Kotaku's liveblog below, typed in real-time by our man in Japan Brian Ashcraft, then stick around for yet another rousing talk from Sony's Shuhei Yoshida, who's going to talk at length about the PlayStation Vita. I know you are thirsty for more talk about Vita.